The 88 Project, August 17, 2018: This translation is the last installment of a series of three letters that Tran Huynh Huy Thuc wrote to his family in June 2018. He has written many, many more letters that cover a variety of topics, but we have chosen these three recent ones which remind the world again of Thuc’s vision, talent, and determination. 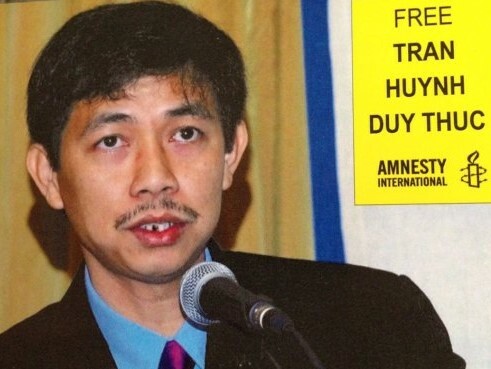 The Vietnamese government has chosen to imprison someone like Thuc who merely wants to promote peace, democracy, and prosperity for his country. We hope these letters will help you understand more about who he is as an individual, a thinker, and a visionary. His place is not behind the bars. He should be free to continue to exercise his rights as an individual and as a citizen to promote the values and peaceful changes for the benefit of his compatriots. Although the rules of development have been elucidated, Chinese authorities would still have to pay the price before they understand and acknowledge what they have done is wrong. This would mean that the US-China trade war would be spread and strained before a state of equilibrium and equality is established. This tense war would last for several years. But I want to write to you and everyone that this trade war is a blessing for our mankind as it replaces World War III, which seems to be inevitable when there is an emergence of new superpowers who want to assert their hegemonic status like Japan and Germany in the past and China in the present. If China’s aggressive rise is not restrained, it won’t be long until their military power is strong enough to counter the US forces in Asia-Pacific, and then military war will inevitably break out. They are intensifying their influence through hastily increasing militarization of the East Sea (South China Sea). The US, Japan, and their Western allies would not miss the opportunity to use economic warfare to undermine China’s aggressive power in order to eliminate the threat of a world war. China is now no longer able to take preemptive actions to quickly assert their control with lightning battles, as the East Sea has now been internationalized as a part of the Indian Ocean – Pacific Ocean. The United Kingdom and France also participate in ensuring freedom of navigation and aviation in this area. Last month, British and French warships entered international waters which China illegally claims sovereignty over, but China did not dare do anything. The United States has withdrawn China’s invitation to participate in the 2018 Rim of the Pacific (RIMPAC) naval exercises and called on China to reverse course on the militarization of the East Sea dispute. The East Sea dispute and Vietnam’s sovereignty will be protected through the ongoing US-China trade war. China has a very small chance of winning. Someone said that China holds a strategic weapon, which is more than $1 trillion of U.S treasury bonds and if China sells these bonds, the United States would weaken; therefore the United States would have to fear. If the Chinese government follows the advice of these experts, China will lose even sooner. The programme Global Overview on channel VTV1 dated June 24, 2018, quoted Dr. Tran Viet Thai, Deputy Director of the Institute for Strategic Studies, Vietnam’s Ministry of Foreign Affairs. Dr. Thai said that China’s behavior has reached the limit of the US’s tolerance. Since the 1970s, the US has helped China by opening up the US market and allowing US technology to support Chinese businesses in international integration with China committing to becoming a responsible major player, the way America did for Europe and Japan after World War II. While Europe, especially Germany, and Japan adhered to the agreements and have become democratic and prosperous nations and have made important contributions to bringing about democracy and prosperity in the world, China is doing the opposite. I agree with Dr. Thai. Looking at the expansion of China’s influence abroad over the past two decades, it is not difficult to see that they are nurturing corrupt governments and dictatorships despite the harmful consequences on citizens under those governments, as long as China gets benefits such as access to resources, land, and over-profitable contracts. That is not to mention the environmental and social damage that China leaves behind. In Africa, such consequences will be irreparable during the next two or three generations. Most people see that image of China. In the beginning of 2004, I talked about this risk in the letter sent to Mr. Triet who, at that time, served as the Party Secretary of Ho Chi Minh City. When the United States and the West uphold the flag of justice and righteousness in the trade war, forcing China to behave responsibly to the world, they will receive international support. A trade war will spread for some time, but at last China would have to concede, accept international law, act responsibly and compete fairly, accept the free market, and stop protecting their home-grown companies. Such things will lead to free society. After the trade war, the world will, once again, see the harmful mistake of “preferring hard over soft measures” which means only accepting and imitating the hard approaches but not learning and reinforcing the soft approaches. The rules of social development will be enlightened more than ever. The enormous efforts of Chinese scholars over the past decades to protect the theories of a market economy driven by far-reaching interventions of the government will become ridiculous. Chinese scholars have long been well-known in the world for such research. I know they are very talented, but they have been controlled so they don’t have the freedom to tell the truth. When the US puts heavy pressure on China, the world will be unstable and affected as well. It is not only about economic but also political and social issues. As I wrote in early 2016, dictatorial governments would be displaced, and only truly democratic countries or countries in transition to democracy with respect for jurisdiction and human rights could prosper without collapsing. America’s aim is not just commercial, but of the world order itself. But it is not the order in which the United States distributes to the other countries, but an order according to the natural rules of development. Whether it is a big or small country, it must respect the rules. The nations that make stronger efforts will rise with the course of the our time. Catching up with the course of our time and racing fast to lead is the historical mission as well as the call of the nation to each Vietnamese individual in this historical time. And I know that our nation needs me at this important moment. That is why I choose to stay in my motherland. Whether as a civilian or a prisoner, I always try my best to do everything I can to help the nation fulfills its historical mission. This has been my ultimate goal for many years. I hope you, our family, and everyone understands and supports my decision. Don’t worry about me. I am not suffering. Everything here is okay. Yes, it is a bit hard, but I am happy. Before the US-China trade war is concluded, Vietnam will be one of the most strongly affected countries. Together with the CPTPP, the EU-Vietnam Free Trade Agreement is very important to help Vietnam reduce the negative impact. In addition, bilateral relations between Vietnam and the US are equally important to help Vietnam avoid US sanctions on China. Therefore, the diplomatic balance of Vietnam will also change sharply. A Deputy Prime Minister of Vietnam is visiting the US. Last night I saw this news on VTV and felt the rapid changes in the coming time. I see this very clearly. The progress of change in Southeast Asia will be much faster and more unexpected than in Northeast Asia with the recent shift of North Korea – a country that has relied almost entirely on China for the past 70 years – now wanting the United States to assure its security and political institutions. Faith in China will continue to deteriorate throughout the world. I can see the movement and accumulation of energy that are not visible on the surface. Understanding the course of our time that follows the natural rules, I can see how the transformation would take place. So, don’t worry about about how long I must stay here. There will come a day no one can keep me in prison.